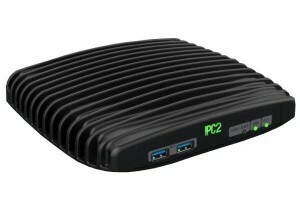 CompuLab have announced two new miniature desktop PCs – the fit-PC4 and the Intense PC2. Based on AMD’s next generation G-Series “Jaguar” SoC, the fit-PC4 will be up to three times as fast as the fit-PC3. With a 2GHz quad-core CPU and up to 16GB of RAM, all still packed into the same tiny, fanless enclosure, this will be one impressive desktop PC. The fit-PC4 also offers dual HDMI display and adds a micro SIM slot, all while consuming 6-24W of power. The Intense PC2 is based on Intel’s 4th generation Intel Core processor and boats a dual-core 2.1GHz CPU with Turbo-Boost up to 3.3GHz. Faster than its predecessor, the Intense PC, the Intense PC2 adds another high-resolution display, making a total of three, plus extra slots for internal SATA devices, USB ports and a micro SIM slot. All packed into the same amazingly small space and using just 8-25W of power. Production on both of these models is underway. We’ll be able to offer these once all necessary compliance testing has been completed.